At the time Pound was working from Ernest Fenollosa’s, and Fenollosa’s Japanese teachers,’ notes to translate classic Chinese poetry, World War I had broken out, and England, where Pound was living, had mobilized to fight this war. Like William Butler Yeats (with whom Pound was staying for part of this time) Pound did not want to take a side in the war. Not only skeptical of the war’s patriotic rationales, Pound also wanted to continue to focus on his modernist artistic revolution. Earlier in the Parlando Project, we’ve seen how Yeats responded at the beginning of the war. His “On Being Asked For a War Poem” cloaked his disdain for statesmen’s’ rhetoric while seeming to take a aesthete’s stance of artistic superiority and inferiority. 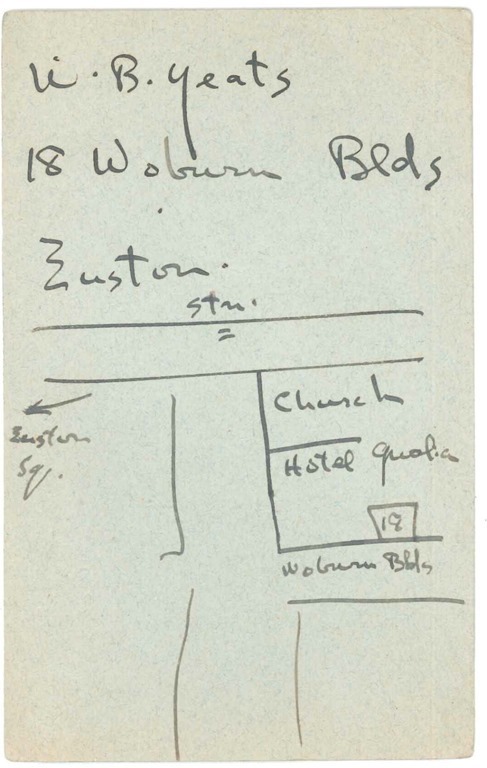 so a helpful Ezra Pound drew him this map. Pound felt similarly. He may not have been sure, at first, of the what he would eventually call lies by the politicians by the end of the war, but his poetic BS meter was immediately sure that the patriotic verse being produced to ennoble the war was false ethically and artistically. But Pound also recognized that any poetry he would write in such a charged environment would be inescapably seen in the context of the war. Still, he was wary of writing about war as a civilian who had never fought in battle. At one point, he reported he had tried to enlist, but was turned down due to his (then neutral) American citizenship. At another point, he wrote a review critical of Rupert Brooke’s war poetry, only to have Brooke, who was serving in the British armed forces, die while in service, leading Pound to qualify that he was only criticizing the poetry, not the citizenship. So as Pound created and promoted Imagism, his vision of new modernist poetry by recreating classical Chinese poetry in English, he came upon a solution. He would use the Chinese poets, both as the model for his new kind of verse and as a way to comment on the war. Today’s audio piece is an example of how Pound went about those two things, once again translating and transforming the work of 9th Century Chinese poet Li Bai. “South Folk in Cold Country” is an account by Li Bai of a military campaign in the north of China that had occurred almost a thousand years before he wrote. Pound, taking this for his modernism, has the soldiers who speak of their war experience say nothing of what they are feeling. There is not a word of them saying they are tired, confused, frustrated, or suffering, but their world is described by them as the image of all these things. While Li Bai/Pound’s “River Merchant’s Wife” reads musically off the page, despite being “free verse” in English, “South Folk in a Cold Country” has a more abrupt and doubtful music. Pound was trusting Li Bai and his own artistic sensibilities so that he might get some of the war experience right. When I first read “South Folk in Cold Country” this year I thought: this sounds like a bag of fortune cookies mixed in with Ernest Hemingway. Either or both of those comparisons may sound dismissive to you, but I suspect the best fortune cookie aphorisms have some relationship, however strained, to the concision of classic Chinese poetry, and Hemingway, however familiar he may seem to us now, was using Pound’s ideas as part of what was to be Hemingway’s revolution in prose. 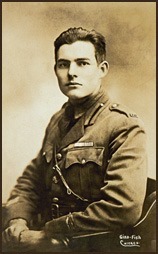 Thanks to Hemingway, and in turn, to Pound who directly influenced and taught him, we now are not surprised by representations of war, violence, and death that assume concise description and charged observation can be truer than superfluous remarks by the author. I did wonder about the General Rishogu mentioned at the end the piece. His Chinese name (remember, Pound was working from notes of Japanese scholars, not Chinese ones) was Li Guang, and his story is here. I like this as an ending. I’m not sure if Li Bai’s soldiers who speak in this piece are using Rishogu/Guang as an example of the hard fate of soldiers; or if they are saying, after what we’ve been through, making all those rapid marches to make Rishogu/Guang’s name, who among them will care about the general’s death. On the odds, I’ll take the later. Musically I used some relentless vibes over electric piano and bass to stand for the rapid marches that the “swift moving” general kept ordering, and then some neighing winds from a synthesizer patch. To hear me perform “South Folk in Cold Country” with that music, use the player gadget below.